As part of the General Federation of Women’s Clubs (GFWC) we enjoy working together to actively promote the civic, cultural, educational, social and spiritual betterment of our community. Visit our Fuquay-Varina Woman’s Club Calendar of Events to learn more about our upcoming group meetings, fundraisers, and community events. We welcome all area women 40 years and older to visit with us during an upcoming club meeting. We meet on the second Monday of the month (September through April) at our Clubhouse located at 602 N. Ennis Street near dowtown Fuquay-Varina. Social time with refreshments begins at 6:45pm and our general meeting begins at 7:15pm. Are you 40 years or younger and looking for a group in our area? Visit our Fuquay-Varina Junior Woman’s Club. We look forward to meeting you and getting to know you. Fuquay-Varina Woman’s Club is a part of District 6 in the state of North Carolina under the General Federation of Women’s Clubs (GFWC). This entry was posted in Blog, Woman's Club News and tagged fuquay-varina ladies group, fuquay-varina woman's club, general federation of womens clubs, gfwc, north carolina service organization, wake county service organization. Bookmark the permalink. This sounds like a great club. I have a friend who lives in Zebulon and have encouraged her to call you as she is a member of the GFWC Milford Young Women’s Club of Milford CT. She will be a wonderful addition to your club and wish you all the best. Thank you very much for helping her get in touch with us Katie!! We also have clubs closer to her area. We will be happy to introduce her to them! Enjoy our delicious Large Turkey Croissant with lettuce and tomato, Potato Salad. and Awesome Homemade Earthquake Cake. More details soon! All orders are pre-sales. Our clubhouse is available to rent. Please contact Dot Mays at (919) 552-6434 for rental information. Join us the second Monday of the month (Sept. through April) at our clubhouse at 602 N. Ennis Street. Social time starts at 6:45 p.m. & our meeting starts at 7:15 p.m. We would love to meet you! Follow us & stay up to date! Receive updates about community and organization events. 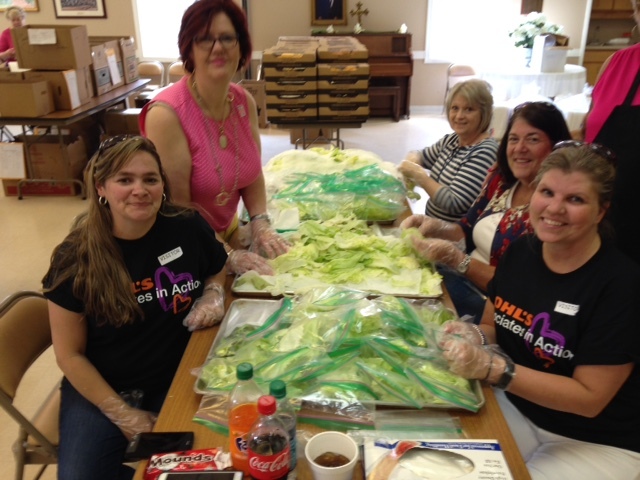 Fuquay-Varina Woman’s Club Box Lunch Fundraiser in April each year.